Translation is one of the common opperations you may want to perform on your shape to position it in a certain place. A common application is to position one shape relative to another. Note: We always take the line of the member through the centroid, regardless of how the shape is translated in the section builder. So the translation of shapes is merely used to get the positioning of shapes correct with respect to each other in the same section. You do not need to translate a section's centroid to the (0,0) coordinate. 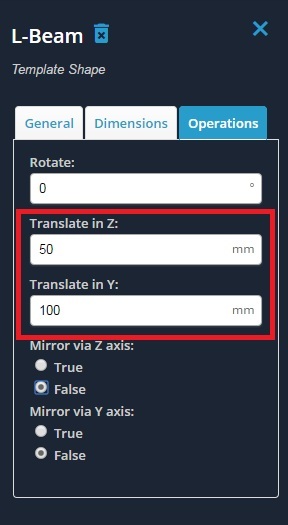 To perform a translation, simply click that shape you wish to translate. In the menu that appears on the right, click the 'Operations' tab. Enter the distance you wish to translate your shape in the Z axis direction (horizontal) or Y axis direction (vertical).